Well done to all the swimmers from Ballinasloe Swimming Club who competed in the Connaught Minor School Championships in Athlone on October 28th. All put in great performances and represented their schools brilliantly. 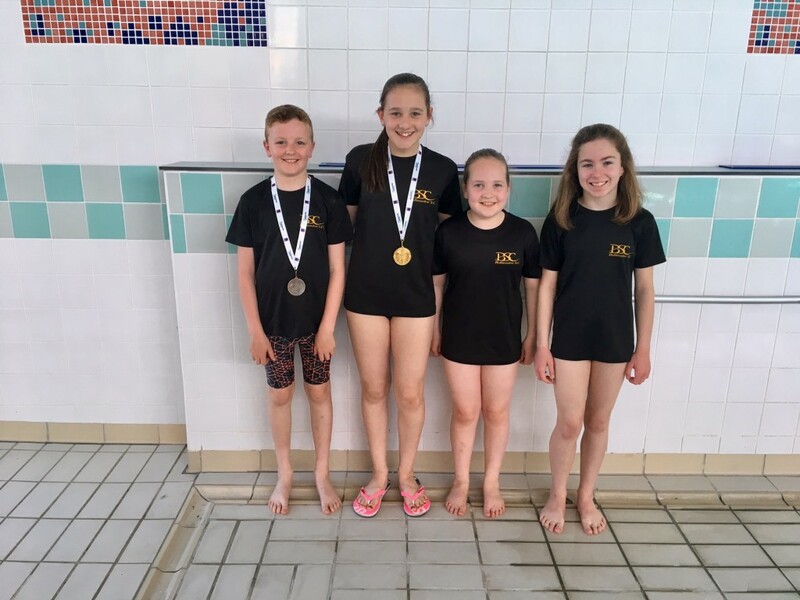 There were four medals won on the day and 5 swimmers will now go on to compete in the National Finals in Dublin next February. Liam Martin won silver in U 12 boys butterfly, Kayla Mc Keon won silver in U12 girls butterfly and Evan Mc Keon won gold in U11 boys IM ( individual medley) and bronze in U11 breaststroke. Kayla also qualified for the nationals in the U 12 freestyle. Sarah Dolan and Matilda Kelly also swam very well, with Sarah getting a qualifying time for the nationals in both the IM and backstroke. Matilda qualified for the nationals in the backstroke swimming very well. Well done also to Ethan Mahon, Philip Costello, Vivienne Naughton and Maia Donnelan who all had personal best performances and did very well. The girls U 10 relay team of Maia Donnelan, Matilda Kelly, Roxy Garvey and Lauren Doran also competed well for Creagh National school. queries contact the club secretary, Sinead on 0879109909. IF YOUR INTERESTED IN JOINING CONTACT OUR SECRETARY SINEAD ON 0879109909 FOR A FREE SWIM TRIAL. WE ACCEPT MEMBERS ANYTIME THROUGHOUT THE TERMS. 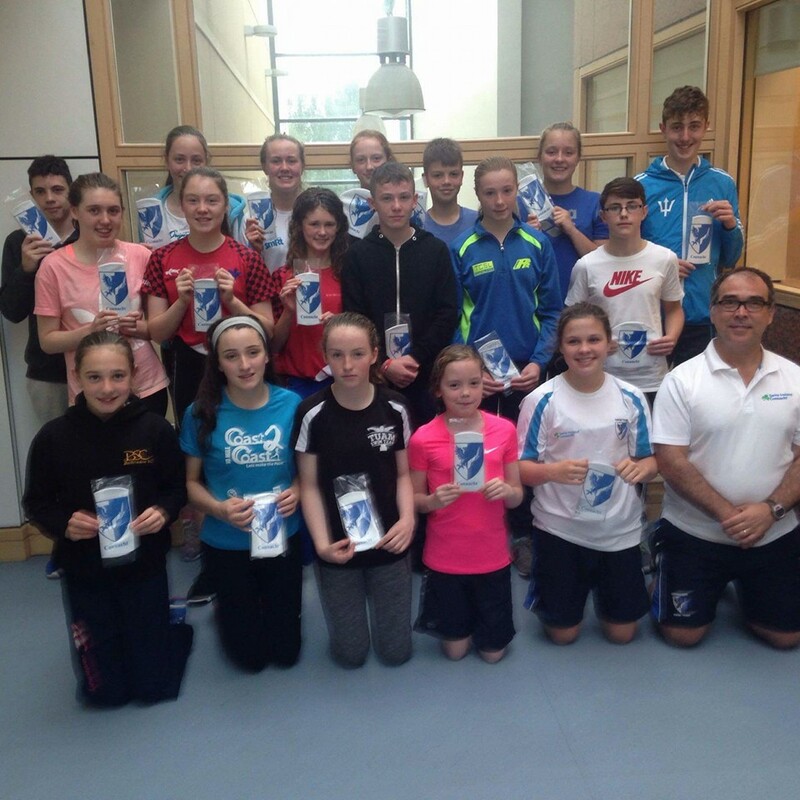 Well done to all the swimmers from Ballinasloe Swimming Club who participated in the county finals recently. The Ballinasloe swimmers put in a great performance at the event with individual swimmers winning 5 gold and four bronze medals. The U13 girls relay team also took gold while the U13 boys team took silver. Many other swimmers made finals and just missed out on medals. Those who win their event can now go on to represent Galway in the National Finals in Limerick next month. Liam Martin, Oisin Kennedy, Philip Costello and Leon Mc Keon.Maia Donnelan came 4th in the final of the U10 girls freestyle and Emily Gillespie came 5th in the final of the U14 girls Backstroke. Liam Martin won the final of the U12 breaststroke, however he was unfortunately disqualified. Overall a great performance from all. WE WILL FINISH TRAINING ON FRIDAY 14TH APRIL AND RESUME ON MONDAY 24TH APRIL. OUR HOME GALA IS ON SUNDAY 30TH APRIL- INFO ON NOTICEBOARD, WEBSITE AND FACEBOOK. PLEASE LET FIONA OR ROCHELLE KNOW WHAT SWIMS YOUR COMPETING IN. LETS GET EVERYONE INVOLVED AND SUPPORT OUR CLUB. Our next term begins on Monday 24th April 2017. We are accepting new members throughout the swimming year, so feel free to contact us at anytime to avail of a swim trial to assess the right options for you or your child’s swimming pathway. We are introducing a new 1 day only training session which we feel will be an alternative option for those who have less time to train on multiple days, however wish to still partake in swim training, be part of a great team of swimmers and enjoy the discipline of a training programme brought to them by our qualified and experienced Head Coach Fiona and Rochelle. Please call our secretary Sinead on 087 9109909 if you are interested in joining Ballinasloe swimming club. 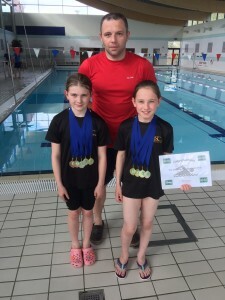 Our swimmers have done well at recent graded galas in Athlone & Carrick. 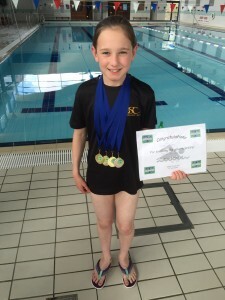 Leon McKeon got A times in both his 200m Breaststroke & 200m Backstroke. Sheenagh Hanrahan got a Gold B time medal for her 50m Butterfly & was just over 1 second off an A time. Kayla McKeon got very close to an A time in the 50m Butterfly & for a Gold C time medal in her 100m . Evan McKeon knocked over 8 seconds off his 50m Butterfly & 14 seconds off his 100m Breaststroke. Conor Hogan got a Silver B time medal for the 200m Backstroke. Ailbhe Hanrahan got a Gold B time medal for the 200m Backstroke. Conor O’Grady knocked 19 seconds off his 50m Butterfly. Ciara Warde got a Gold C time Medal for the 100m Backstroke. Sarah Dolan got a PB in the 100m Freestyle. 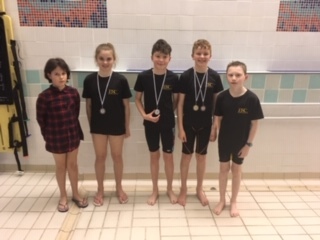 Well done to all, a number of these swimmers were out of age competing u11 even though Evan McKeon was 8, Kayla McKeon 9, Sarah Dolan 9 & Leon McKeon 10. 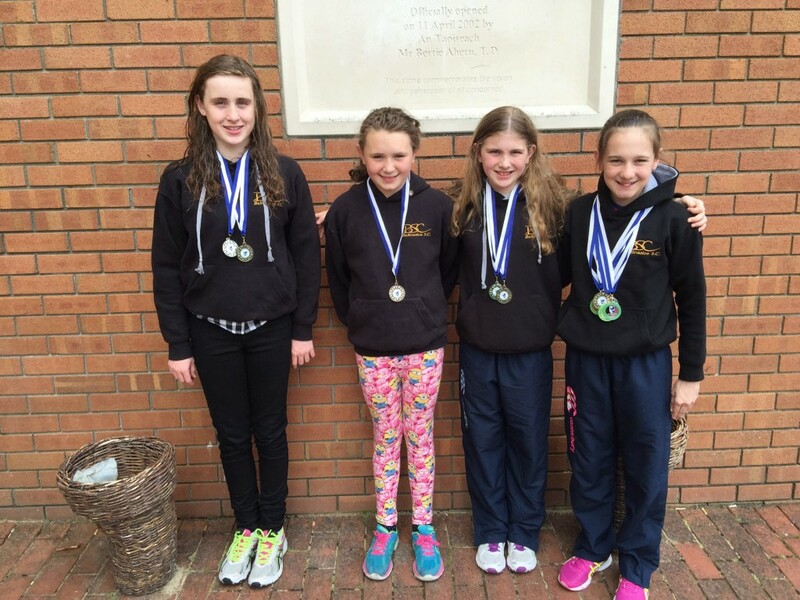 Well done to our 5 swimmers who competed in a recent A gala in Longford. 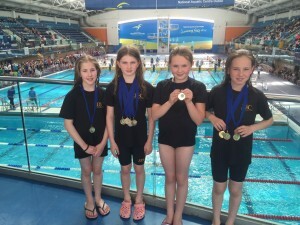 Ruth Dolan, Caoimhe Kennedy, Tara & Ava McKeon won Silver in the medley relay. 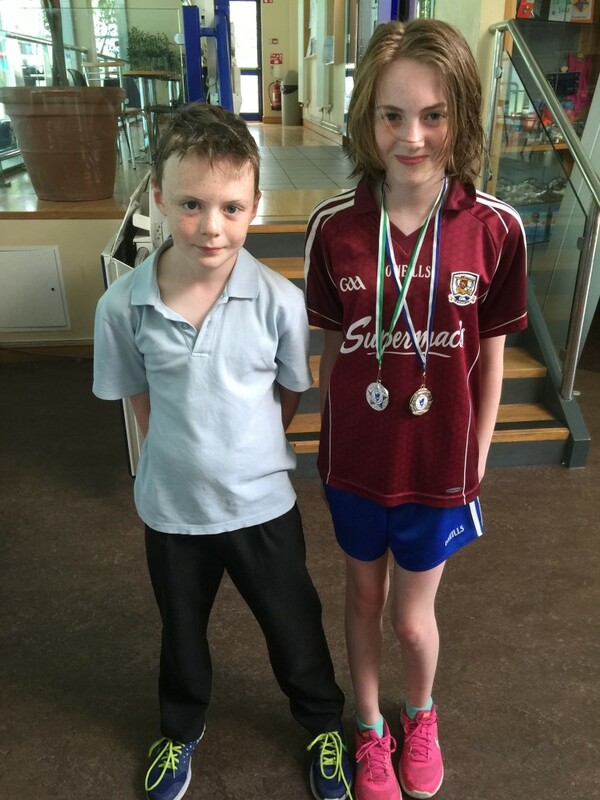 Congratulation to Ruth Dolan who performed exceptionally well at the recent Connacht Short Course Championships in Leisureland. Ruth who is 12 was competing under 14 and won silver in the 50m Breaststroke & Bronze in the 100m IM. Well done also to Ethan Moran, Tara Mckeon & Caoimhe Kennedy who all swam very well. Ballinasloe swimming club have an ongoing agreement with the council to manage Coral Leisure car park during fair week, allowing cars to park there for a fee, which our swimming club then get to keep. This is our main fundraising event throughout the year and provides us with necessary funds for the club. We always endeavour to keep fees as reasonable as possible & fundraising is necessary to accomplish this. We need help with these fundraising events as our committee is small and a lot of parents say at the AGM that while they are unable to join the committee, they will be happy to help in any way they can. Now we need your help & lower membership fees benefit everyone. We will operate the car park from 10am – 6pm on Sun Oct 2nd and Mon Oct 3rd. We will operate in teams of two and the more volunteers we have the shorter the time frame required per pair. Please text Monica on 0877432787 with an idea of what days/times suit. We appreciate your assistance with this. Congratulations to Ethan Moran & Ruth Dolan who both have made it onto the Connacht Development Squad. This is a great achievement & is a testament to all their hard work in the pool. Photo below includes Ruth receiving her CT Squad hat at her first CT squad training session in Galway last Sunday. Well done guys, it’s great to see BSC members on the squad! Ballinasloe Swimming Club will return on Monday Sept 5th. We have a new experienced head coach – Fiona Flynn, who will be available to coach all sessions assisted by Rochelle. Call Monica on 087 7432787 if you are interested in joining or want additional information. 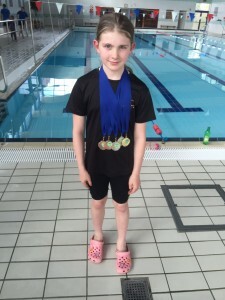 Well done to Ruth Dolan who performed brilliantly at the Division 1 Irish Age Group Championship at the National Aquatic Centre over the weekend. She finished in 5th position in the U12 100m Butterfly heat & 4th in the u12 100m Breaststroke heat which qualified her for the finals in both strokes. She finished in 5th place in the Breaststroke final which is a fantastic achievement competing against the strongest swimmers in the country. Well done to Caoimhe Kennedy who swam very well on Friday in the Girls 12&U 100 Backstroke. Ethan Moran had two excellent swims yesterday in the Boys 16-18 100m. He made it into the final where he finished in 5th position with a fantastic P.B. time of 59.19. He was the fastest 16 year old in the race. Well done to both of them! Best of luck to Ethan Moran & Caoimhe Kennedy who are both competing in the Division 2 National Championship in Limerick this weekend. Ava McKeon also made the qualifying time but is unable to attend. 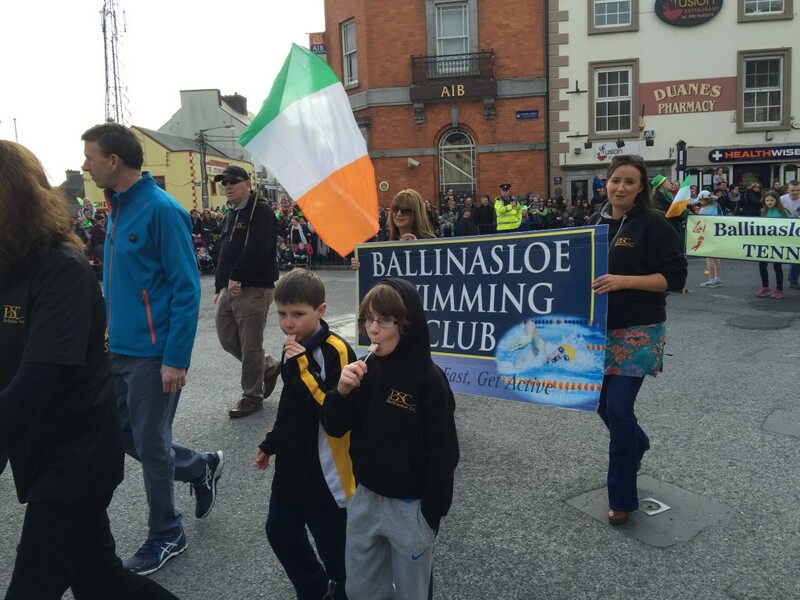 Ballinasloe Swimming Club had swimmers representing our club in Longford in June 2016. They all performed magnificently on the day. Tara McKeon swam excellently in this event, setting a PB with a time of 3.02.10. Ailbhe Hanrahan had an excellent swim and finished with an impressive time of 1.41.15, which is a PB for Ailbhe. Ailbhe Hanrahan had an excellent swim and finished with an impressive time of 1.19.54, which is a PB and an A time for Ailbhe. 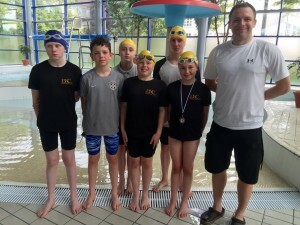 Ballinasloe Swimming Club are very proud of the swimmers who represented our club at the Munster/Connacht Age Groups Long Course (50m pool) Championships which were held in Limerick on May 21st & 22nd. The qualifying times are tough so it’s a testament to their hard work in the pool to achieve the necessary times to compete against the strongest swimmers in both provinces. Ethan Moran age 16 had 3 strong swims including the Boys age 16-17 100 Breaststroke where he finished 8th, the 100 Butterfly where he finished 5th & the 100 Freestyle where he finished in the top 10. Ethan’s times in the Breaststroke, Butterfly & Freestyle all met the qualifying times for the National Irish Age Groups Division 2 Championships Boys age 16-18 which will be held in Limerick between 30th June & 3rd July 2016. 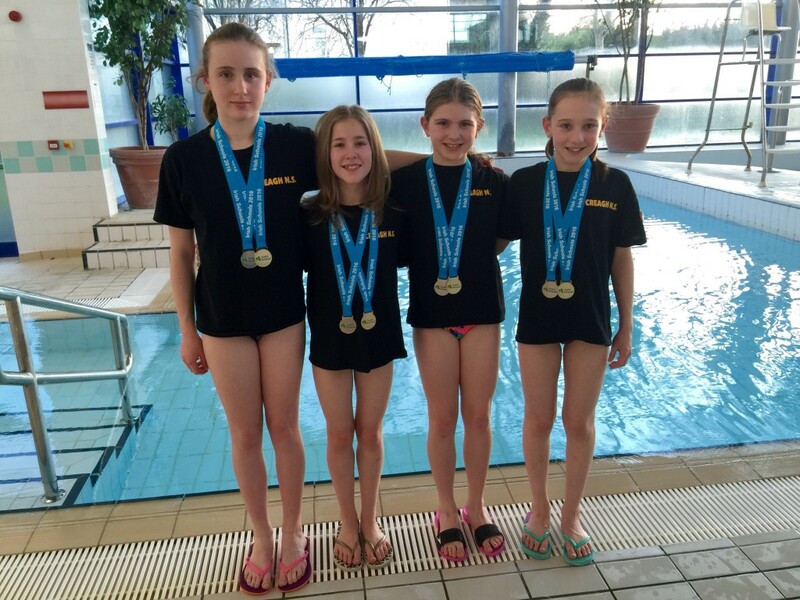 Ruth Dolan, Tara & Ava McKeon & Caoimhe Kennedy all competed in the Girls 12&U age group. 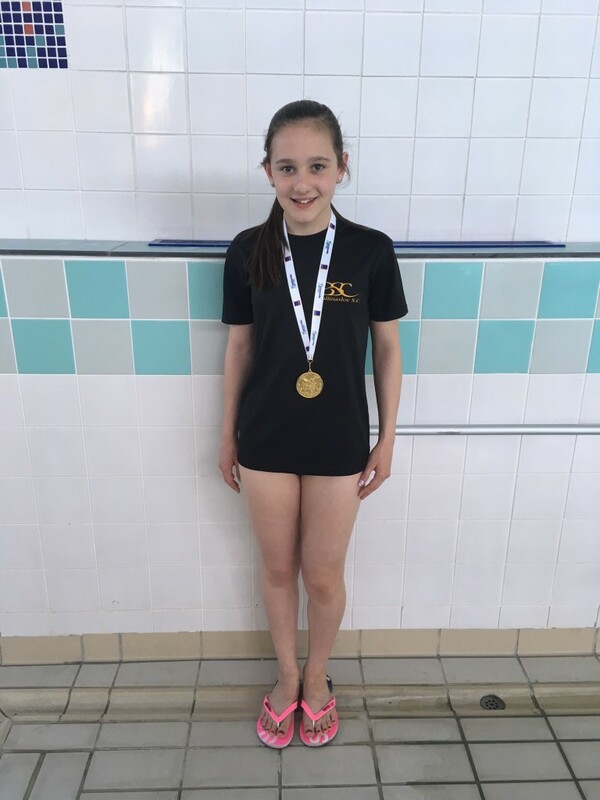 Ruth Dolan age 11 had an outstanding weekend finishing 1st to take the Gold in both the 100m Butterfly & the 100m Freestyle, she came 2nd in the 200m Individual Medley (all 4 strokes) & she came 3rd in the Breaststroke. This was a magnificent achievement amongst such stiff competition. 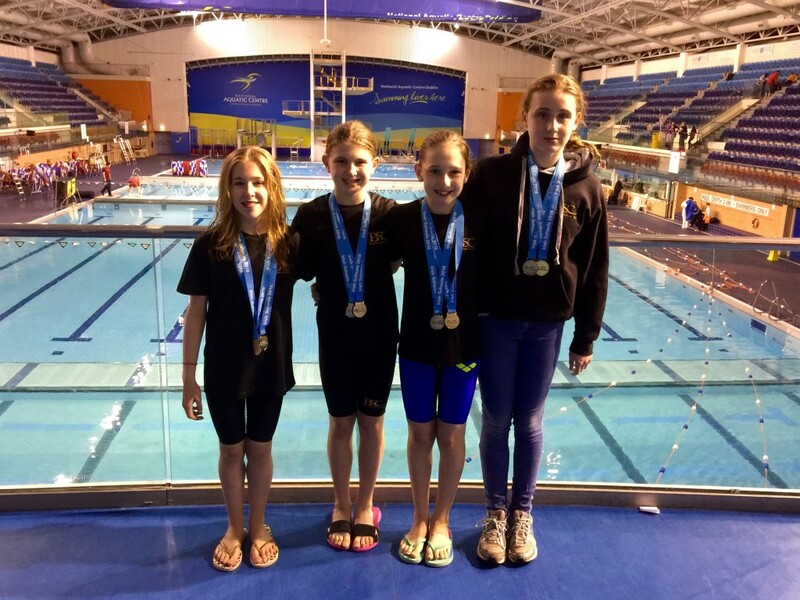 Ruth’s times were so good she met the tough qualifying times in all strokes for the Girls 12&U National Irish Age Groups Division 1 Championships which will be held in the National Aquatic Centre in Dublin between July 20 to 24 2016. Ava McKeon was the only 10 year old in the girls 12&U Freestyle & 100m Breaststroke. She finished in the top 10 in both & met the qualifying time for the National Irish Age Groups Division 2 Championships Girls 12&U Freestyle & was less than a second off in the Breaststroke. Caoimhe Kennedy age 11 swam very well in the 100M Backstroke. 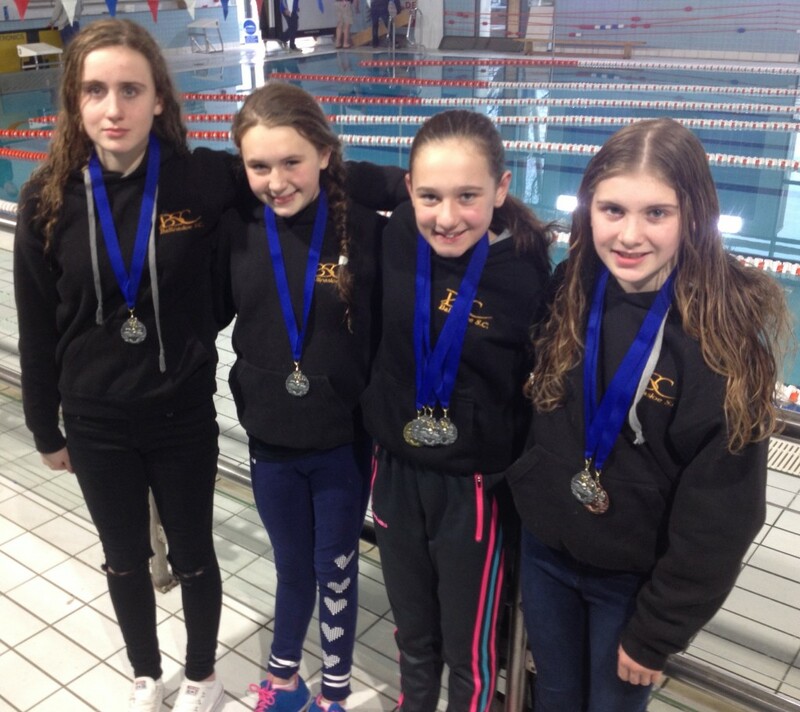 On day 1 Ruth Dolan, Tara & Ava McKeon and Ailbhe Hanrahan won Silver in the Girls Freestyle Relay. On day 2 Ruth Dolan, Tara & Ava McKeon and Caoimhe Kennedy won Bronze in the Girls Medley Relay. 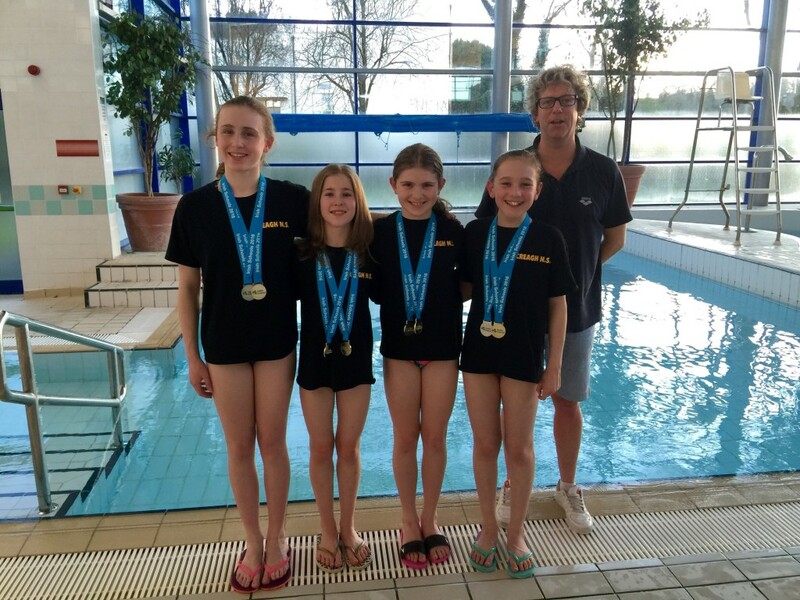 These girls previously won Gold in the Medley Relay & Silver in the Freestyle Relay at the National Minor School Championships in February. Well done to all of them it is great to see all their hard work paying off. Full results are available on our results page. Well done to all those who participated in the Ballinasloe B/C Graded Gala yesterday. Katie Naughton & Ailbhe Hanrahan achieved A times & many of our swimmers won medals & got PB’s on the day. 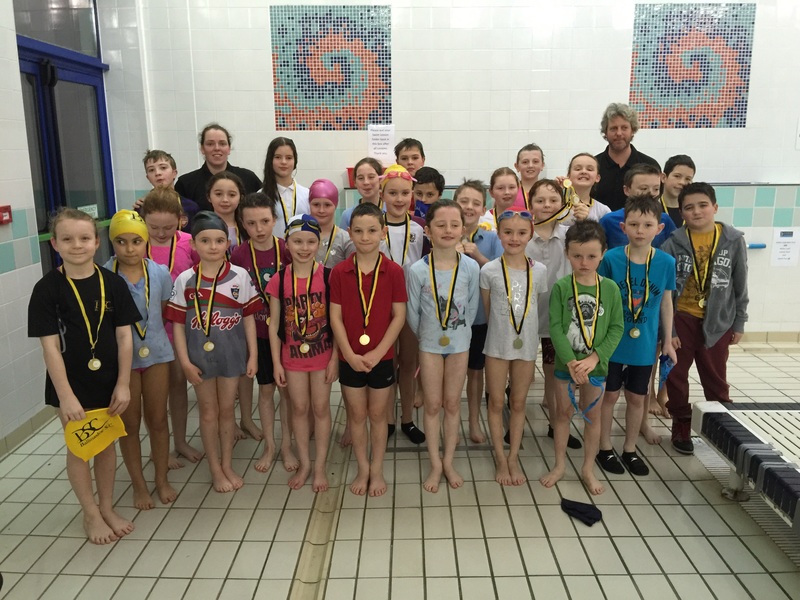 It was the first time in quite a few years that Ballinasloe hosted a Connacht Graded Gala. Thanks to all those who helped on the day to make the gala go off smoothly. Kayla McKeon put in an excellent performance resulting in a PB time of 48.50. Tani McCormack had a great swim resulting in a PB time of 59.23. Tani got a silver medal for a C time. Alison Markham swam brilliantly and got a PB of 1.55.28. Alison got a silver medal for a C time. Leon McKeon put in an excellent performance resulting in a gold medal and a PB time of 1.40.38. Conor Hogan put in an excellent performance resulting in a gold medal and a PB time of 1.41.98. Kayla McKeon put in an excellent performance finishing with a time of 2.05.67. Tani McCormack had a great swim resulting in a PB time of 2.05.67. Leon McKeon put in an excellent performance finishing with a PB time of 1.58.14. Leon got a silver medal. Tani McCormack had a great swim resulting in a PB time of 1.50.58. Aoife Burnell put in an excellent performance resulting in a PB time of 1.39.17. Alison Markham swam brilliantly and got a PB of 1.49.27. Alison got a silver medal for a C time. Leon McKeon put in an excellent performance finishing with a PB time of 1.28.46. 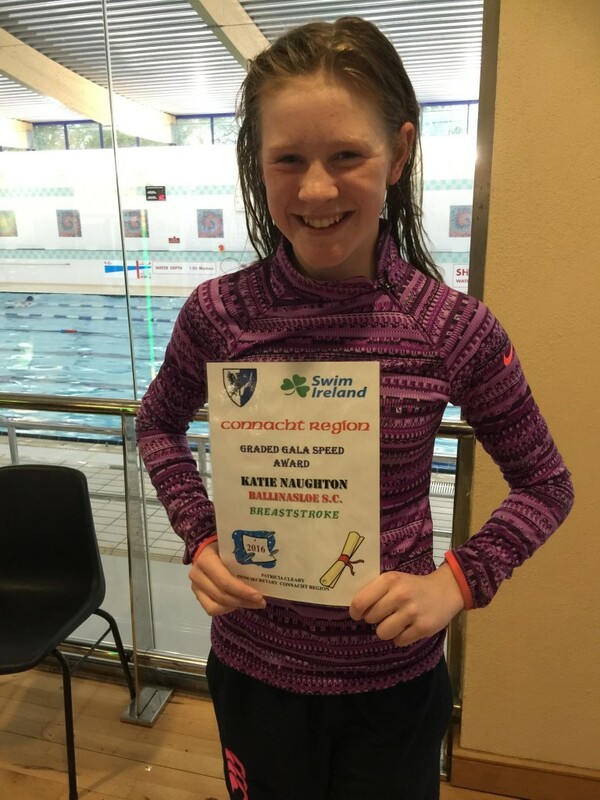 Well done to Katie Naughton who received a Swim Connacht certificate for getting an A time in the Breaststroke & to Conor Harley for getting his A time in the 200IM at a recent graded gala. It’s great to see all their hard work in the pool paying off. Congrats to both of them. Ballinasloe Swimming Club had 6 ( 4 girls and 2 boys ) swimmers representing our club at the A gala which was held in Athlone in March 2016. They all performed splendidly on the day. Ethan Moran swam brilliantly in this event and finished with a time of 5.45.51 which was a PB for Ethan. Ruth Dolan had an excellent swim in this event with a time of 1.19.33 which was the 3rd fastest time and got her a bronze medal. This was also a PB for Ruth. Tara McKeon had a great swim in this event finishing with a PB time of 1.27.30. Ruth Dolan had a superb swim in this event with a PB time of 1.17.62 which was the 2nd fastest time and got her a silver medal. Tara McKeon put in a brilliant performance and finished with a time of 1.27.57 which is a PB for Tara. Conor Harley had an excellent swim and finished with a time of 1.35.28 which is a PB for Conor. Ethan Moran put in an excellent performance resulting in him finishing in the top 8 with a time of 1.11.34 which is a PB for Ethan. Ruth Dolan had an excellent swim in this event with a time of 1.27.25 which was the 2nd fastest time and got her a silver medal. This was also a PB for Ruth. Caoimhe Kennedy had a great swim in this event finishing with a PB time of 1.43.87. Caoimhe Kennedy put in a splendid effort and had a great swim in this event finishing with a PB time of 1.18.85. 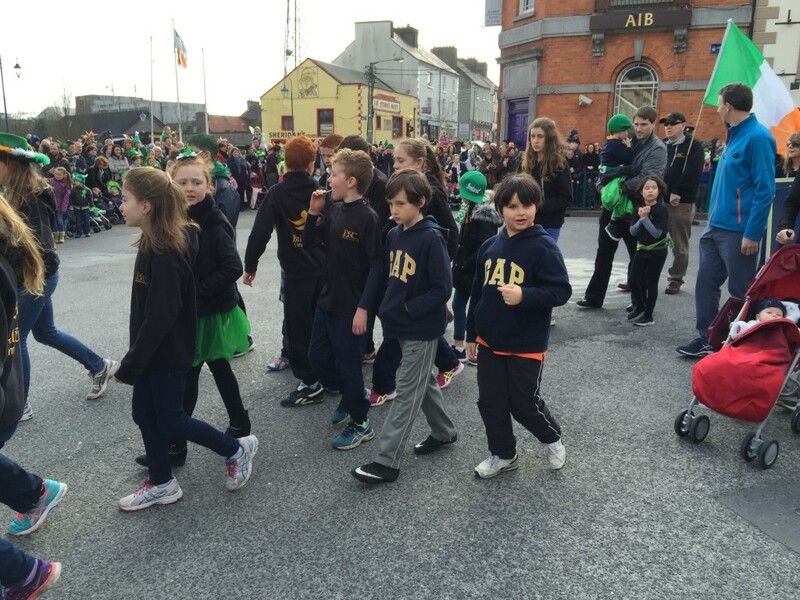 BSC participating in Ballinasloe’s St. Patrick’s Day Parade. Great fun had by all involved. 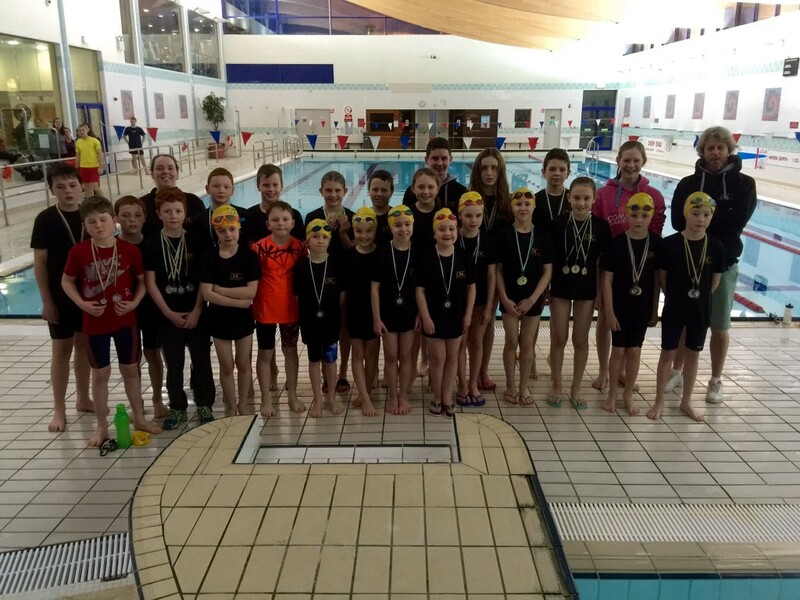 Ballinasloe Swimming Club had 16 swimmers (7 girls & 9 boys) representing our club in Longford on 27th February 2016. They all performed magnificently on the day. This was the first gala for 1 of our swimmers and she did brilliantly. Conor O Grady had a great swim in this event and achieved a PB with a time of 4.28.03 and received a silver medal for a C time. Conor Harley had an excellent swim in this event and finished in second place with a fantastic time of 3.08.13 achieving an A time. 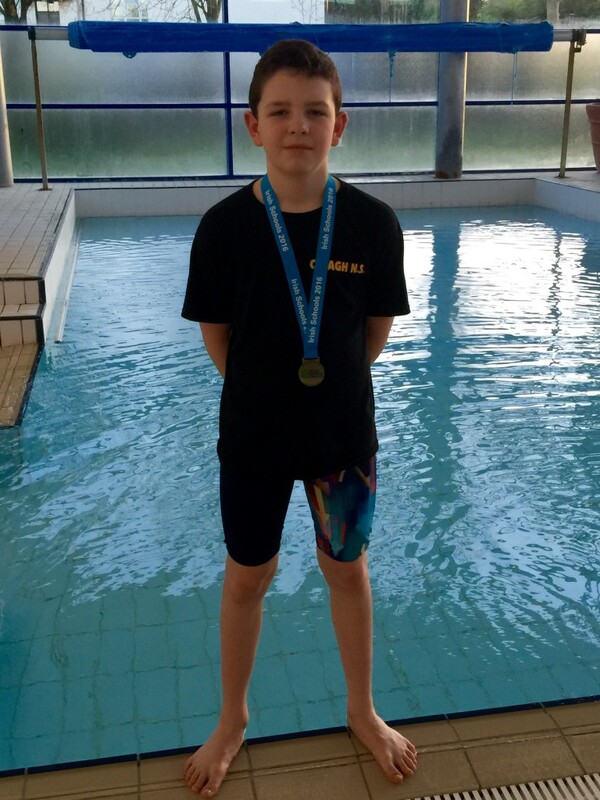 Rowan Harley had a brilliant swim setting a PB with a time of 3.08.15 coming in 1st place and got a gold medal for his effort. Kayla McKeon swam excellently in this event, setting a PB with a time of 2.00.64. She was the 3rd fastest 9 year old to finish. Sheenagh Hanrahan put in a splendid effort and got a PB with a time of 2.10.06. Emily Gillespie had a great swim and finished with a time of 2.33.36. This was Emily’s 1st gala. Well done Emily. Tani McCormack had a brilliant swim finishing with a time of 2.09.34 which is a PB for Tani. Ailbhe Hanrahan had an excellent swim and finished with an impressive time of 1.52.23, which is a PB for Ailbhe. Lilly Cunniffe swam excellently in this event, setting a PB with a time of 2.32.28. Katie Naughton put in a superb effort in this event and finished with a time of 1.39.84 which is an A time. Evan McKeon swam excellently in this event, setting a PB with a time of 2.12.26. He was the 2nd fastest 8 year old to finish. Leon McKeon swam well in this event, setting a PB with a time of 1.55.82. He was the 2nd fastest 9 year old to finish. Daniel Mooney put in a splendid effort and got a PB with a time of 2.21.07. He was the 4th fastest 8 year old to finish. Charlie Mooney swam superbly in this event and finished with a time of 2.08.48 , which is a PB. Conor O Grady had a brilliant swim finishing with a time of 2.24.91 which is a PB for Conor. Conor Hogan had a brilliant swim finishing with a time of 1.57.39 which is a PB and got him a gold medal for a C Time. Michael O Grady swam superbly in this event and finished with a time of 2.12.96, which is a PB. Kayla McKeon swam excellently in this event, setting a PB with a time of 3.34.00. She was the 2nd fastest 9 year old to finish. Sheenagh Hanrahan put in a splendid effort and got a PB with a time of 3.45.44. Tani McCormack had a brilliant swim finishing with a time of 3.55.14. Ailbhe Hanrahan had an excellent swim and finished with an impressive time of 3.05.88, which is a PB for Ailbhe. Evan McKeon swam excellently in this event, setting a PB with a time of 3.46.20. He was the fastest 8 year old to finish. Leon McKeon swam well in this event, setting a PB with a time of 3.11.86. Leon received a bronze medal for a C Time for his efforts. Daniel Mooney put in a splendid effort and got a PB with a time of 3.59.99. He was the 2nd fastest 8 year old to finish. Conor O Grady had a brilliant swim finishing with a time of 3.50.19 which is a PB for Conor. Conor Hogan had a brilliant swim finishing with a time of 3.096.52 which is a PB and got him a gold medal for a C Time. Michael O Grady swam superbly in this event and finished with a time of 3.33.43, which is a PB and got him a bronze medal for a C Time. Rowan Harley had a brilliant swim setting a PB with a time of 3.08.15 coming in 2nd place and got a silver medal for his effort. 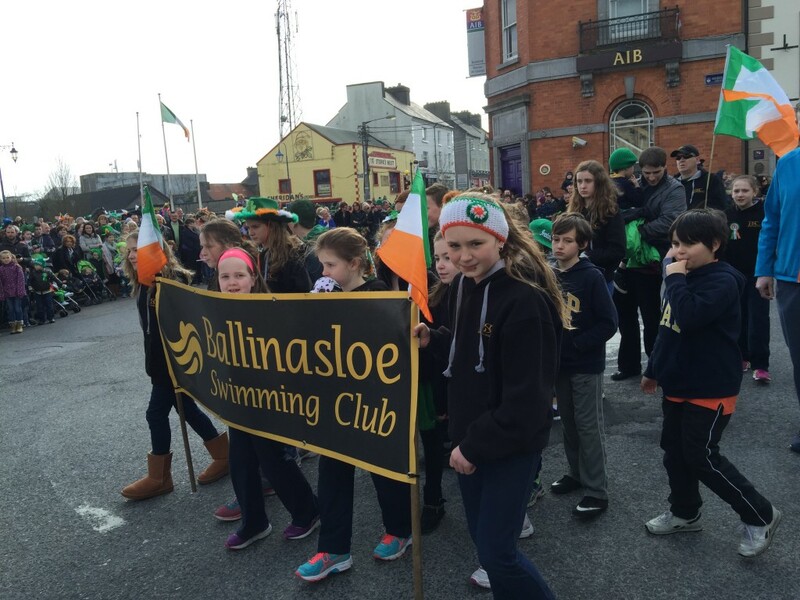 BALLINASLOE SWIMMING CLUB WILL BE PARTICIPATING IN THIS YEARS ST. PATRICK’S DAY PARADE WHICH TAKES PLACE ON THURSDAY MARCH 17TH. WE WILL ASSEMBLE AT THE FAIR GREEN AT 1.30 PM. WE WOULD LIKE PEOPLE TO WEAR THE CLUB COLOURS OF BLACK & AMBER (OR YELLOW). IF YOU HAVE A CLUB HOODIE YOU CAN WEAR IT BUT IT IS NOT REQUIRED. OBVIOUSLY IF THE DAY IS COLD WE WOULD EXPECT EVERYONE TO WEAR A COAT. THE THEME IS CELEBRATING 1916 TO 2016. PARENTS ARE WELCOME TO MARCH WITH US. The Irish National Minor School Championship was held in the National Aquatic Centre in Dublin on Sunday February 7th. 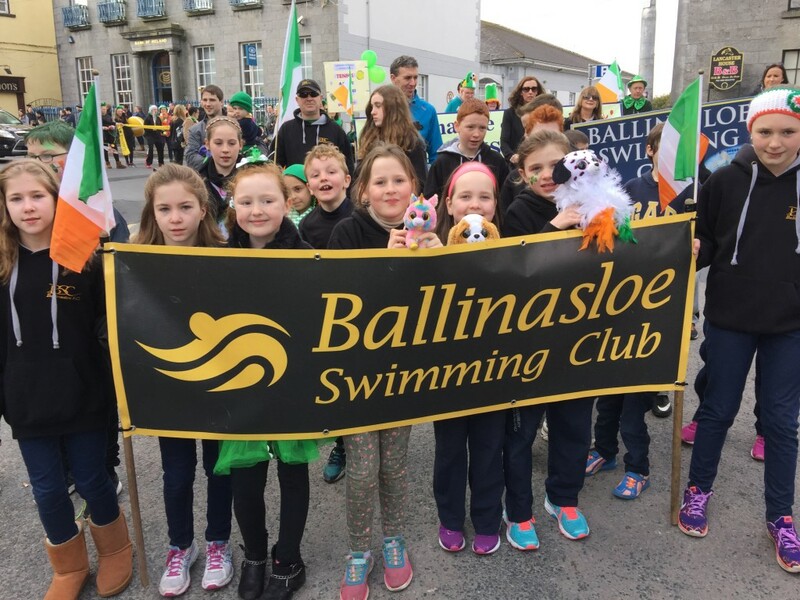 12 swimmers from Ballinasloe swim club represented their National Schools in individual events & an additional 6 represented Creagh NS in Relay events. The competition in the Minor Schools is exceptionally high with the best young swimmers in the country making it into the Nationals. 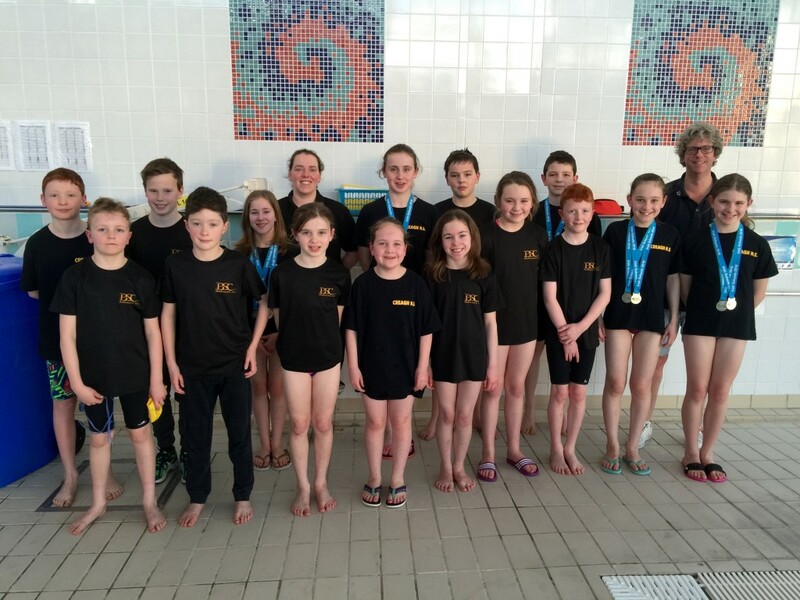 Well done to all who competed, both Ballinasloe Swimming Club & their schools are very proud of them. Well done to all who made it into the finals on the day as this places each of them amongst the top 10 strongest swimmers in the country in that event. For those who won medals amongst such stiff competition it is a testament to all the hard work they put in throughout the year. We would like to thank their coaches Brendan Breathnach & Rochelle Stockil Trappe for all their hard work. Kayla McKeon (Creagh NS) performed splendidly on the day she had the 5th fastest time in the heats of the 50M Backstroke & got into the final where she finished 9th. Kayla made it into the final where she finished in 4th position in the 50M Butterfly. Evan McKeon (Creagh NS) had two good swims in both the 50M Breaststroke & the 50M Backstroke, he will be under 9 again next year. Charlie Mooney (Creagh NS) put in a good performance in the 50M Freestyle finishing in 14th position. Ava McKeon (Creagh NS) had 2 excellent swims in both the 50m Butterfly & the 100M Individual Medley. Ava made in into the final where she finished in 7th place in the Butterfly. She had the 6th fastest time in the 100M IM. Tara McKeon (Creagh NS) put in a great performance in the 50m Butterfly, she made it into the final where she finished in 8th place. She also swam well in the 100M Individual Medley finishing 13th out of the 48 girls in this event. Ruth Dolan (Creagh NS) swam brilliantly in the 50M Backstroke, she made it into the final where she had the 4th fastest time in this event. She also swam well in the 100M IM. Caoimhe Kennedy (Gaelscoil Ballinasloe) performed very well in both in both the 50m Backstroke & the 50M Butterfly getting PB’s in both. James Mooney (Creagh NS) performed brilliantly in the 50M Breaststroke, he made it into the final where he had a super swim finishing in 3rd position which earned him a National Bronze medal. (James won silver in this event last year). He also had a good swim in the 50M Free. 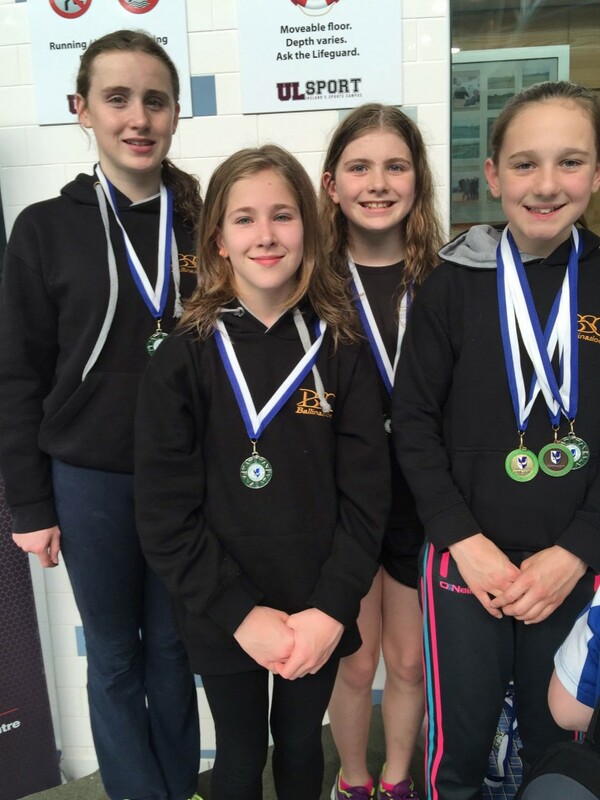 Kayla Mc Keon, Sheenagh Hanrahan, Emma McGreal, Sarah Dolan – the four girls swam very well, they made it into the final where they finished in 6th place. 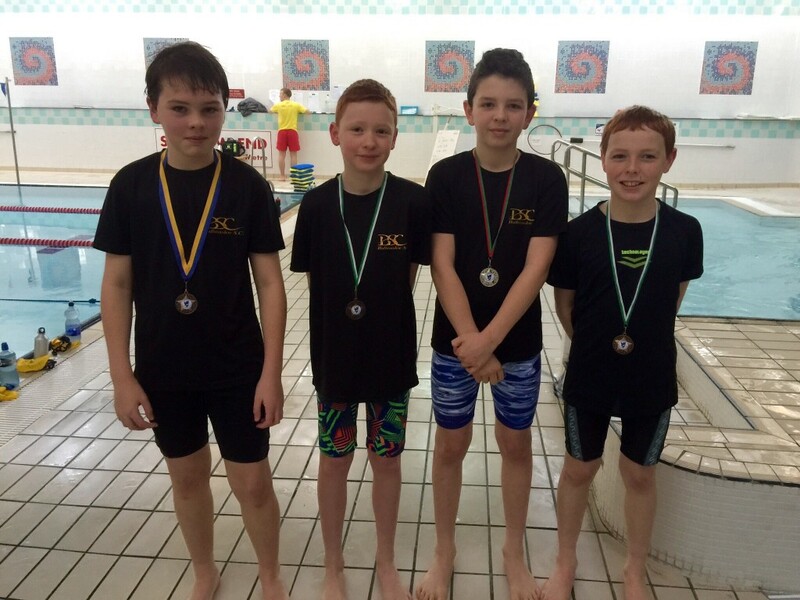 Leon McKeon, Charlie Mooney, Liam Martin, Evan McKeon – the four boys performed very well, they came 5th in the Medley Relay which was a great achievement. Tara Mc Keon, Ruth Dolan, Ava Mc Keon, Ailbhe Hanrahan – all 4 girls performed brilliantly finished 1st place which earned each of them won a National Gold medal. Tara Mc Keon, Ruth Dolan, Ava Mc Keon, Ailbhe Hanrahan – the four girls once again performed superbly finishing in 2nd position earning themselves a National Silver medal. James Mooney, Conor Hogan, Adam Mc Greal, Hugh Killeen – they all performed well in both relays. Ballinasloe Swimming Club had 16 swimmers (6 girls & 10 boys) representing our club in Carrick-On-Shannon on 30th January 2016. They all performed magnificently on the day. 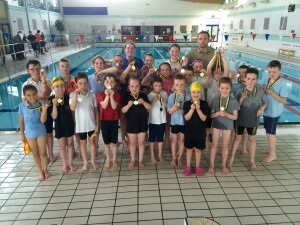 This was the first gala for 3 of our swimmers and they did brilliantly. Evan McKeon was the fastest 7 year old finishing with a time of 1.54.21. Daniel Mooney had a great swim finishing with a time of 2.08.93. He was the 2nd fastest 8 year old. This was Daniels first gala. Leon McKeon had an excellent swim in this event finishing 5th position with a time of 1.42.54. He was the 2nd fastest 9 year old to finish. Charlie Mooney swam splendidly finishing in 8th position with a time of 1.46.41 which was a PB for Charlie. He will be eligible to swim in the 11 & Under category again next year. Conor O’Grady set a PB of 2.02.81.He can swim in the 11 & Under category again next year. Daniel Mooney had a great swim finishing with a time of 5.14.21. He was the 2nd fastest 8 year old to finish. Leon McKeon had an excellent swim in this event finishing 4th position with a time of 4.05.29. He was the fastest 9 year old to finish. Charlie Mooney swam splendidly finishing in the top 10 position with a time of 4.24.99. Conor O’Grady had an great swim and finished with a time of 5.13.78. Erin Gallagher swam well in this event and got a time of 1.53.99. She was the 7th fastest 10 year old to finish. Sheenagh Hanrahan put in a splendid effort and got a PB, with a time of 1.56.41 which was a PB. She was the 8th fastest 10 year old to finish. Daniel Mooney had a great swim, finishing with a time of 2.03.96. He was the 3rd fastest 8 year old to finish. Leon McKeon had an excellent swim in this event, finishing with a time of 1.38.83. He was the 3rd fastest 9 year old to finish. Charlie Mooney swam splendidly finishing in 7th position with a time of 1.31.27 which was a PB for Charlie. Conor O’Grady set a PB of 1.54.31. Well done Conor. Conor Hogan swam brilliantly in this event setting a PB and a B time of 1.33.92. Conor finished in the top 4. Michael O’Grady finished in the top 6 with a time of 1.41.95 which was a PB. Ballinasloe Swimming Club had 8 ( 4 girls and 4 boys ) swimmers representing our club at the A gala which was held in Tuam on 17 January 2016. They all performed splendidly on the day. Conor Harley put in an excellent performance and finished with a time of 6.02.02. Conor had the 6th fastest time in this event. James Mooney swam brilliantly in this event and finished with a time of 6.03.27. Rowan Harley swam really well in this event and finished with a time of 6.02.11. Ethan Moran put in a splendid performance and finished with a time of 5.06.46. Ruth Dolan had an excellent swim in this event with a time of 1.30.34 which was the 2nd fastest time and got her a silver medal. Ruth earned herself a Division 1 time. Caoimhe Kennedy put in a brilliant performance and finished with a time of 1.50.99. Conor Harley had a brilliant swim in this event finishing with a time of 1.43.04 which was the 2nd fastest time and got him a silver medal. James Mooney swam splendidly this event finishing with a time of 1.32.20. James was the 3rd fastest 12 year old. Ruth Dolan had an excellent swim in this event with a time of 2.56.55 which was the 2nd fastest time and got her a silver medal. Caoimhe Kennedy put in a brilliant performance and finished with a time of 3.23.56. Tara McKeon put in a brilliant performance and finished with a time of 3.03.97. Conor Harley had an excellent swim and finished in the top 7 with a time of 3.19.98. James Mooney put in a splendid performance and finished with a time of 3.14.58. Rowan Harley had an excellent swim and finished with a time of 3.12.92. Ethan Moran put in an excellent performance resulting in him finishing in the top 8 with a time of 2.35.10. Ava McKeon swam brilliantly in this event finishing in the top 6 with a time of 5.59.01. Ava was the fastest 10 year old in this event. Ruth Dolan had an excellent swim in this event with a time of 5.43.40 finishing in the top 4. Caoimhe Kennedy put in a brilliant performance and finished with a time of 6.33.89. Tara McKeon swam brilliantly and finished with a time of 5.38.76. she was in the top 10 fastest 12 year olds to finish. Conor Harley swam brilliantly on the day and finished with a time of 1.19.55. He finished in the top 7 in this event. James Mooney swam well in this event resulting in a time of 1.16.44. Ava McKeon swam brilliantly in this event finishing in the top 6 with a time of 1.14.35 which is a Division 2 time. Ava was the fastest 10 year old in this event. Ruth Dolan had an excellent swim in this event with a time of 1.12.29 which is a Division 2 time. Ruth finished 3rd and won a bronze medal. Ethan Moran put in a brilliant performance and finished 2nd with a time of 3.00.57. Ethan won a silver medal in this event. Tara McKeon swam excellently in this event and finished in the top 7 with a time of 3.25.45. Tara was the 4th fastest 12 year old. 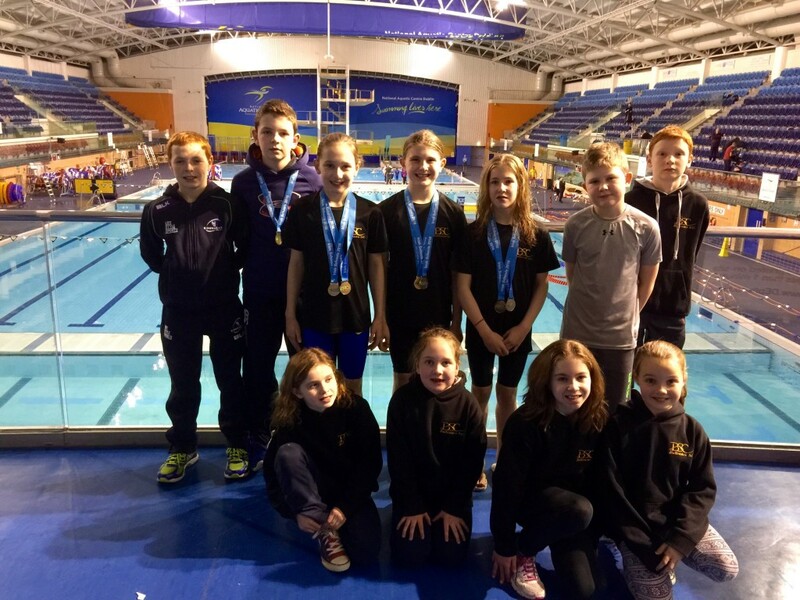 Ballinasloe Swimming Club had 6 ( 4 girls and 2 boys ) swimmers representing our club at the A gala which was held in Leisureland, Galway on 13 December 2015. They all performed excellently on the day. Ava McKeon finished with a great time of 3.09.05. She was the fastest 10 year old to finish and will be eligible again for the next 2 years. Ruth Dolan swam splendidly and finished with a time of 3.02.24. She was the 4th fastest 11 year old to finish. Ruth can also swim this event again next year. Caoimhe Kennedy put in a great performance and finished with a time of 3.15.65. Tara McKeon had an excellent swim and finished with an impressive time of 3.02.28. Conor Harley put in an excellent performance and finished with a time of 3.17.96. Conor will be eligible to swim this event again next year. Ethan Moran swam excellently in this event and finished in the top 10 with a time of 2.32.69. Ruth Dolan had a great swim and finished with an impressive time of 3.01.46. She was the 4th fastest 11 year old to finish. Caoimhe Kennedy had an excellent swim in this event and finished with a time of 3.29.11. Tara McKeon had an excellent swim and finished with an impressive time of 3.03.93. Conor Harley put in an excellent performance in this event and finished with a time of 3.10.57. Conor was the 2nd fastest 11 year old to finish. Ethan Moran had a great swim in this event and finished with a time of 2.37.63. Ava McKeon put in an excellent performance and finished with a time of 2.50.06. She was the 2nd fastest 10 year old to finish. She will be eligible to swim this event again next year. Ruth Dolan swam splendidly and finished with a time of 2.45.17. She was the 5th fastest 11 year old to finish. Ruth can also swim this event again next year. Caoimhe Kennedy put in an excellent performance and finished with a time of 3.11.60. Tara McKeon had a splendid swim and finished with a time of 2.48.86. Conor Harley swam superbly in this event and finished with a time of 3.00.82. He was in the top 7 11 year olds to finish. 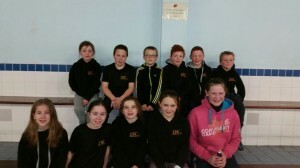 The Connacht Minor School Swimming Championship was held on Saturday January 9th. 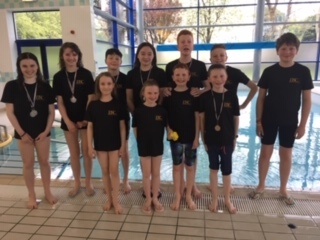 There were 22 very talented young swimmers from Ballinasloe Swimming Club representing various National Schools, 19 in individual events and an additional 3 were part of relay teams. Our very talented swimmers had the most successful day out at the Connacht Schools than we’ve had in years. We won 3 individual Gold medals, 3 individual Silver medals & 5 individual Bronze medals. 8 swimmers qualified for the National School Championships in 2 strokes & 4 more qualified in 1 stroke. 6 relay teams qualified for the Nationals with our talented young relay teams who all represented Creagh NS winning 2 Gold, 1 Silver & 3 Bronze. 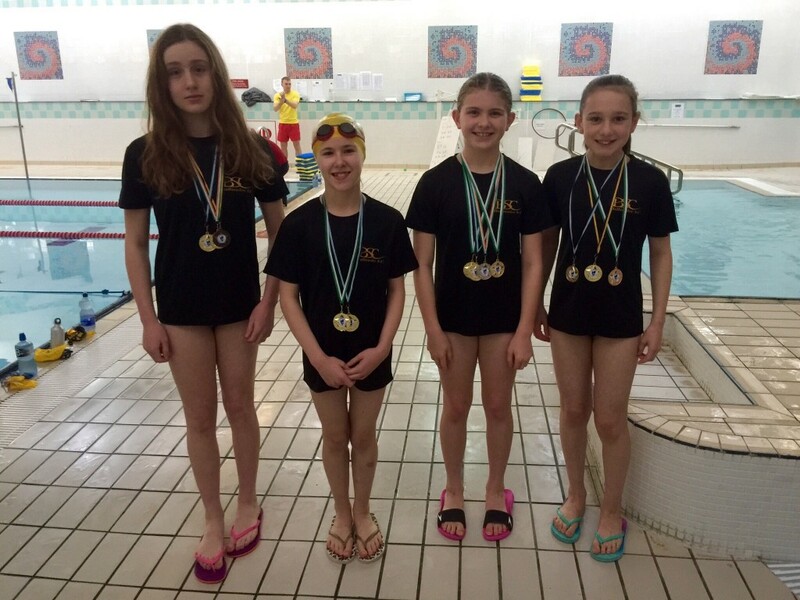 5 swimmers from our club qualified for the Nationals in 2014 & 2015. We would like to thank our head coach Brendan Breathnach & his assistant coach Rochelle Stockil Trappe for all the hard work they put in to coaching our very talented swimmers. All strokes 50M except for the 100M Individual Medley. Sarah Dolan (Creagh NS) competed in the Freestyle and did very well in her first major gala. Kayla McKeon (Creagh NS) had 2 strong swims, she came 6th in the Backstroke & met the qualifying time for the National Minor Schools & she won Bronze in the Butterfly with just .41 seconds separating the top 3. Evan McKeon (Creagh NS) performed brilliantly at his first gala. 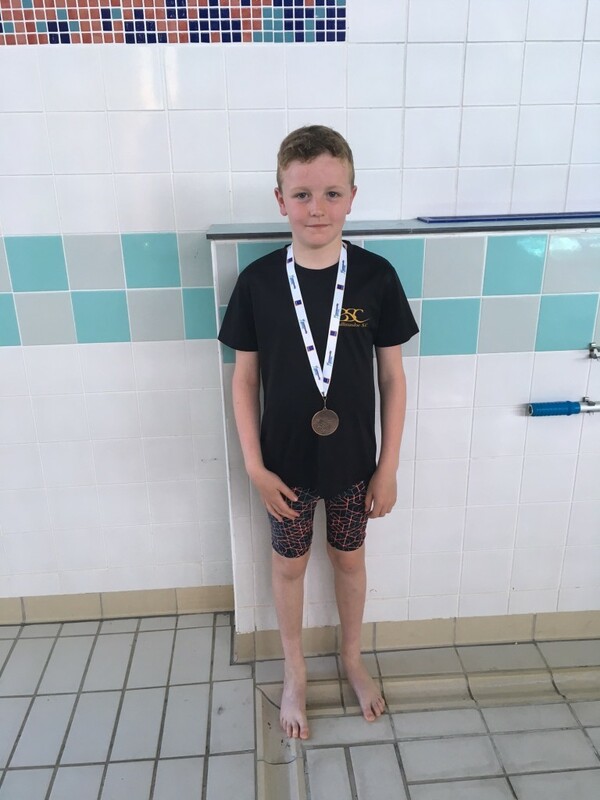 Evan will be U9 again next year & won Gold in the Breaststroke & came 6th in the Backstroke where he also met the qualifying time for the Nationals. Aaron Hogan (Creagh NS) had a great day at his first gala finished 7th in the Breaststroke & missed the qualifying time by just .64 seconds & he won a Bronze medal in the Butterfly. Daniel Mooney (Creagh NS) swam well finished 7th in the Freestyle & 6th in the Breaststroke where he missed out on the qualifying time for the Nationals by just .08 seconds. Sheenagh Hanrahan (Creagh NS) swam well in the Freestyle & finished 4th in the Butterfly. 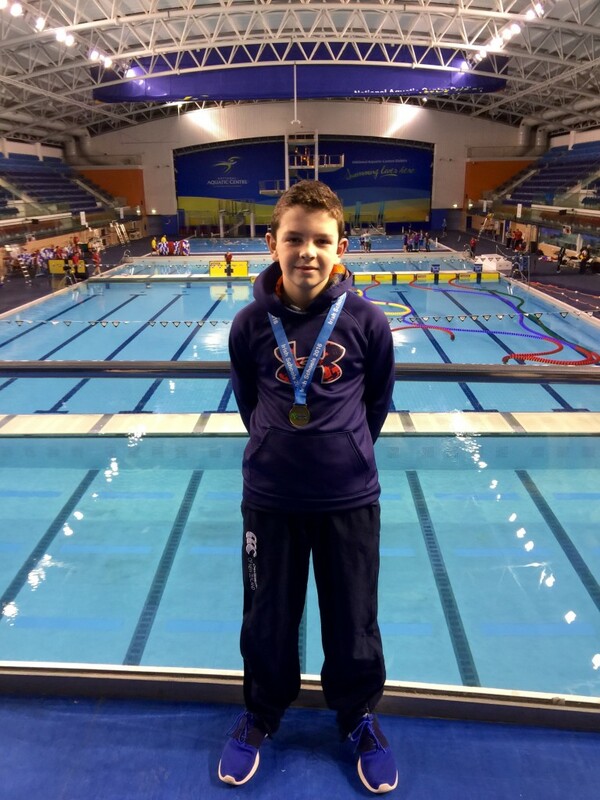 Leon McKeon (Creagh NS) had 2 excellent swims, he won Silver in the Breaststroke & Bronze in the Backstroke. Charlie Mooney (Creagh NS) swam very well in the Freestyle where he finished in 5th place & met the qualifying time for the Nationals. Gearoid Markham (Kiltormer NS) had two good swims in the Freestyle & Breaststroke where he finished in 10th position. Ava McKeon (Creagh NS) performed brilliantly on the day winning Gold in the Butterfly & Silver in the 100M Individual Medley (all 4 strokes). Tani McCormack (Menlough NS) swam well in both the Freestyle & Breaststroke. Ailbhe Hanrahan (Creagh NS) swam very well got a PB in her Freestyle & met the qualifying time for the Nationals in the 50M Butterfly. Ruth Dolan (Creagh NS) performed superbly on the day winning Gold in the Backstroke & finishing 4th in the 100M Individual Medley, she met the qualifying times in both strokes. Caoimhe Kennedy (Gaelscoil Ballinasloe) had 2 fine swims finishing 7th in the Backstroke & 6th in the Butterfly while making the qualifying times for the Nationals in both. Tara McKeon (Creagh NS) performed strongly on the day where she won a Bronze medal in the 50M Butterfly & 7th in the 100M Individual Medley, she met the qualifying times in both. Conor Harley (Attyrory NS) swam well in the Freestyle where he finished in 10th place & finished 6th in the Individual Medley where he made the qualifying time for the Nationals. Conor Hogan (Creagh NS) swam well in both the Freestyle & Breaststroke. 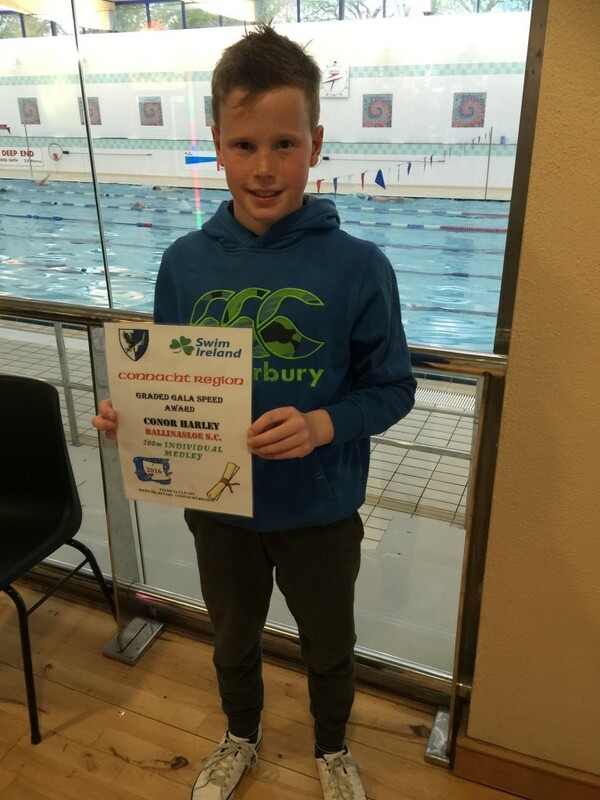 James Mooney (Creagh NS) performed strongly on the day, he finished 5th in the Freestyle & met the qualifying time for the Nationals, he won silver in the Breaststroke (James won a National silver medal in the Breaststroke at the Nationals last year). 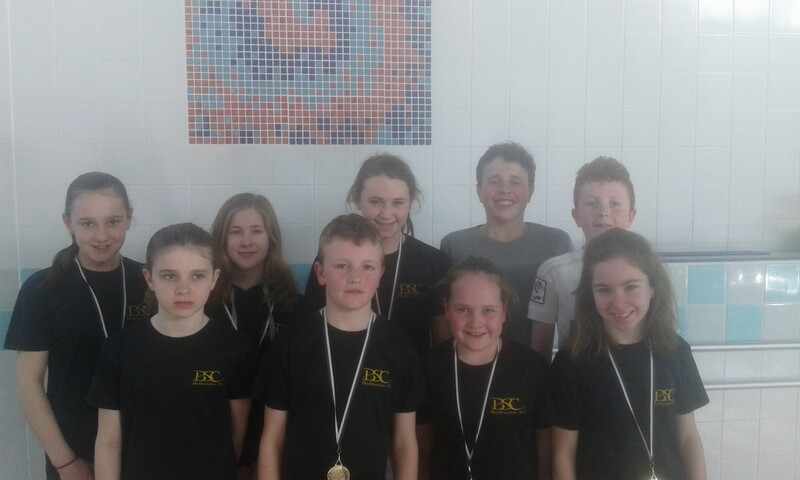 Well done to everyone from Ballinasloe Swimming Club who competed especially those who swam in a gala for the first time, they should all be very proud of themselves as they are a credit to both Ballinasloe Swimming Club & to the School which they represented. 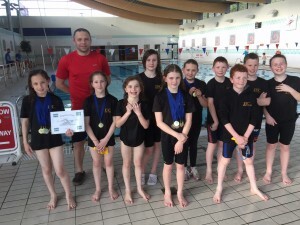 These young swimmers did themselves proud while competing against the best swimmers in Connacht. Best of luck to the following swimmers who now go on to represent their school in the National Minor School Championship which will be held in the National Aquatic Centre in Dublin on February 7th. Ballinasloe Swimming Club had 3 swimmers in the Connacht Secondary Schools Swimming Championship which was held on Sunday Jan 10th. Katie Naughton (Ardscoil Mhuire) had two strong swims & got personal best times in the 100M Backstroke & Breaststroke. Rowan Harley (Garbally College) had two excellent swims & got personal best times in both the 100M Freestyle Backstroke. Ethan Moran (St. Raphael’s Loughrea) performed magnificently on the day finishing 9th in the 100M Freestyle & 7th in the 100M Butterfly while also getting PB’s in both. Ballinasloe Swimming Club’s new term begins on Mon Jan 4th & will continue until Fri March 25t. Come along to our Christmas Disco which we are holding in conjunction with the Camogie Club again this year. There will be a DJ, food & lots of fun. Parents are also welcome, we require at least one parent to remain with children aged 8 or under. Please text Geraldine Hogan on 087 7755092 if you wish to attend. 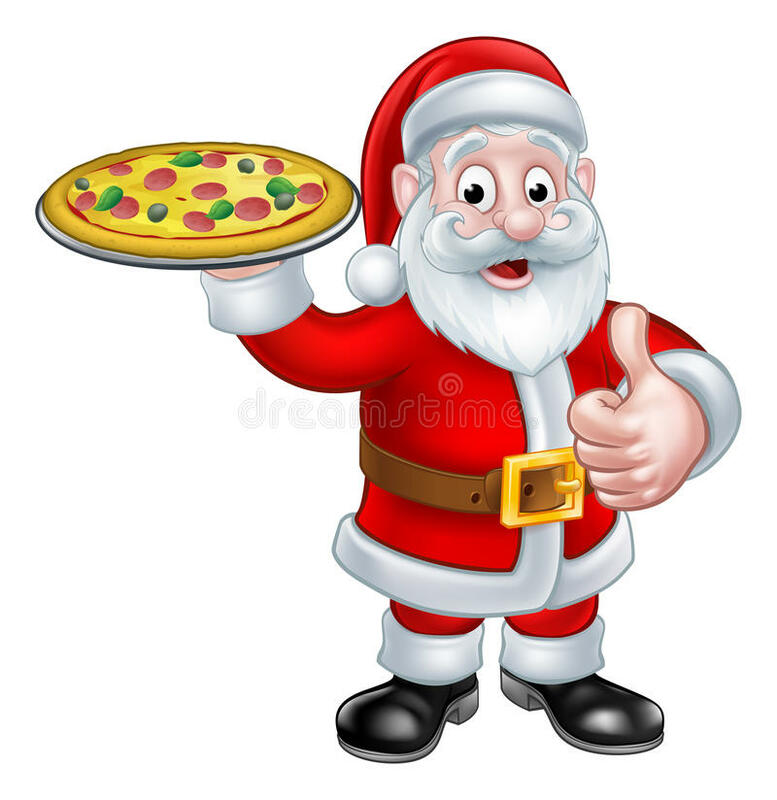 We are asking for a €4 fee per child towards the food which should be given to Geraldine at training today. Well done to Caoimhe who recently received her A Certificates after acquiring her A times in both the Backstroke & Butterfly at the Comans Gala in Nov.
Ballinasloe Swimming Club had 11 swimmers representing our club at the Comans gala in Roscommon on 21st November 2015. They all performed splendidly on the day. Kayla McKeon put in an excellent performance resulting in a B time of 50.11. She was the fastest 8 yr old in this category. Leon McKeon put in a strong performance which resulted in a B time of 50.97. Leon was in the top 2 9 year old to complete his category. Rowan Harley put in a super performance finishing in the top 3 with a time of 1:40.17 which got him a gold medal. Kayla McKeon put in an excellent performance resulting in a time of 3:36.76. She was the fastest 8 year old in this category. Rowan Harley put in a super performance finishing in the top 2 and achieving a silver medal and a B time of 2:52.86. Leon McKeon put in a strong performance which resulted in a B time of 143.99. Conor Hogan achieved a time of 1:50.37 after a brilliant swim in this event. 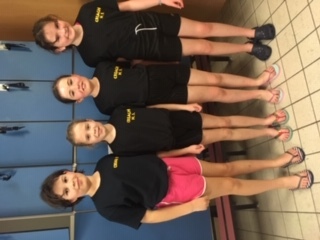 Ballinasloe Swimming Club had 4 swimmers representing our club at the A gala which was held in Longford on Nov 15th. This was their 2nd time attending an A gala & they all performed splendidly on the day. Ethan Moran put in a very strong performance in the 400IM resulting in a great time of 6.11.28 which was also a PB. Ruth Dolan had a brilliant swim in 11&U Butterfly where she finished with a fantastic time of 1.31.14 which was the 4th fastest time in this age group & a PB for Ruth). Tara McKeon (who just moved up into the 12-13 age group a week before this gala) had a great swim resulting in a time of 1.29.68 which was also a PB. Tara was in the top 8 12 year olds. James Mooney (who also just moved up into the age 12-13 category) put in a super performance resulting in a PB with a time of 1.22.95. Ethan swam once again in the 14-15 category, he had another strong performance resulting in another PB of 1.15.25. Ruth Dolan (11&U) had another brilliant swim knocking 3 seconds off her previous PB with a time of 1.15.59, this was amongst the top 5 times in this age group. James Mooney (age 12-13) had a great time of 1.16.19 which was also a PB. Ruth Dolan (11&U) put in her 3rd strong performance of the day in the 100IM, she had a fantastic time of 1.25.14 which was the 4th fastest time in this age group & another PB for Ruth. Tara McKeon (12-13) had yet another super swim with a time of 1.26.63 which was another PB. Tara was in the top 7 12 year olds. James Mooney (12-13) had a brilliant swim in the 100IM, he had a super time of 1.22.95 which was another PB. James was the 3rd fastest 12 year old. Ballinasloe Swimming Club are delighted to announce that going forward Brendan Breathnach will be available to coach every Monday, Wednesday & Friday along with Rochelle. Brendan has been coaching with Galway Swimming Club for the past 8 years. BSC are delighted to welcome Brendan back to the Club where he first learned to swim (very successfully) in his youth. We look forward to him bringing his experience and managerial skills to BSC and we are certain our club will flourish under his leadership going forward. BSC would like to thank Kayo for his service to the club over the past 2 years & we wish him all the best in the future. Thanks to all those who attended Ballinasloe Swimming Club’s AGM on Friday evening, there were just under 30 people present which is more than triple the usual attendance. We are delighted that so many additional people are taking an interest & we hope that this will continue. Results for election to BSC’s committee – Declan McKeon voted back in as Chairperson, Monica McKeon returns as Secretary, we welcome Ivan Kelly onboard as Treasurer, Fintan Kennedy returns as Assistant Treasurer, Marcella McCormack has changed position & will now be PRO, we welcome Teresa Dolan as Gala Secretary & Geraldine Hogan as Club Development Officer, Sinead McKeon returns as CCO (Club Children’s Officer) & Maria Miguel will be our 2nd CCO. Thanks to all those who volunteered & we look forward to working with you all to make BSC even stronger over the coming year. We currently have a waiting list to get into the club as we are operating at full capacity. Ballinasloe Swimming Club’s new term will run from Fri Sept 4th – Fri Dec 18th. Sessions same as last term – A squad Mon, Wed, Fri 5-6.30pm, Sat 12-2pm (this includes a land based session upstairs in Coral Leisure from 1-2pm). B squad Mon & Wed 4-5pm, Fri 6.30-7.30pm. We are looking forward to seeing all of you back at the pool. Any new members can call Monica at 0877432787 for additional information. 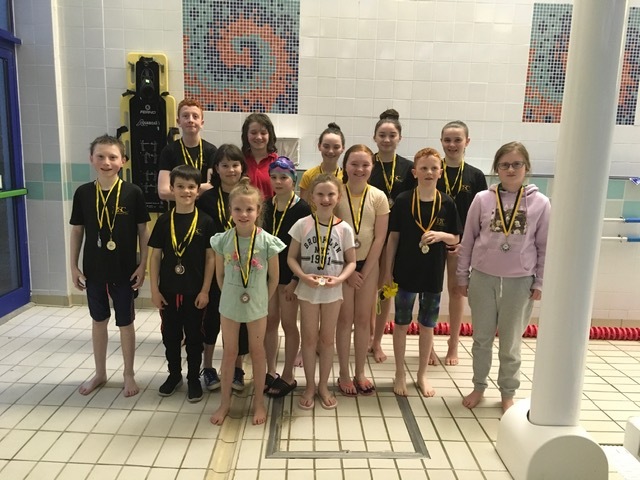 Ballinasloe Swimming Club would like to congratulate all of our swimmers who participated in the Galway Swimming Community Games which was held in Tuam on June 20th. Well done to all of them on their fantastic performances, they did our club proud. 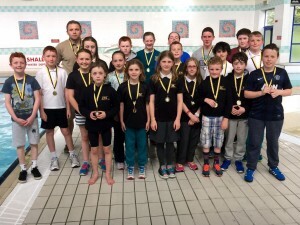 17 swimmers competed and came home with 14 individual medals 4 gold, 4 silver & 6 bronze. Our U13 Girls relay got gold and won their race nearly 25m ahead of the competition and our U13 boys relay got the bronze. Ballinasloe Swimming Club would like to wish the best of luck to the following 4 individual swimmers who along with the U13 Girls Relay Team will now go on to represent Galway County in the National Community Games which will be held in Athlone on August 15/16. Tara McKeon, Ruth Dolan, Ava McKeon, Caoimhe Kennedy, Ailbhe Hanrahan. Ballinasloe Swimming Club Gala Wed June 17th. BSC’s internal Gala was held on Wed June 17th. Both the B & A Squad’s Galas were a great success. Connacht Regional Gala Longford May 31st. 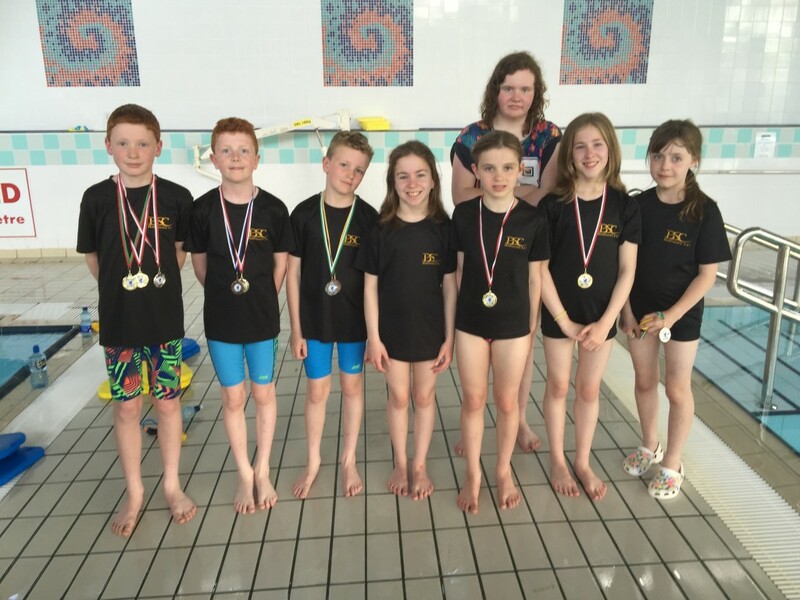 Well done to the swimmers from Ballinasloe SC who participated in the Connacht Regional Gala which was held in Longford on Sunday June 1st. The 200m A Gala was held first and we had 3 swimmers in this gala. James Mooney competed in both the 200m Breaststroke & Freestyle. He got a superb time division 2 time of 3.32.89 in the Breaststroke which earned him a silver medal and he got a good B time in the 200m Freestyle. Ethan Moran swam in the 14&Over Breaststroke where he put in a fabulous performance to get a division 2 time of 2.22.88 which earned him a Bronze medal. Tara McKeon competed in the 200m Freestyle and she got an excellent time of 2.50.55 which was well inside the 3.00 A time, she knocked 23.55 seconds off her previous PB. 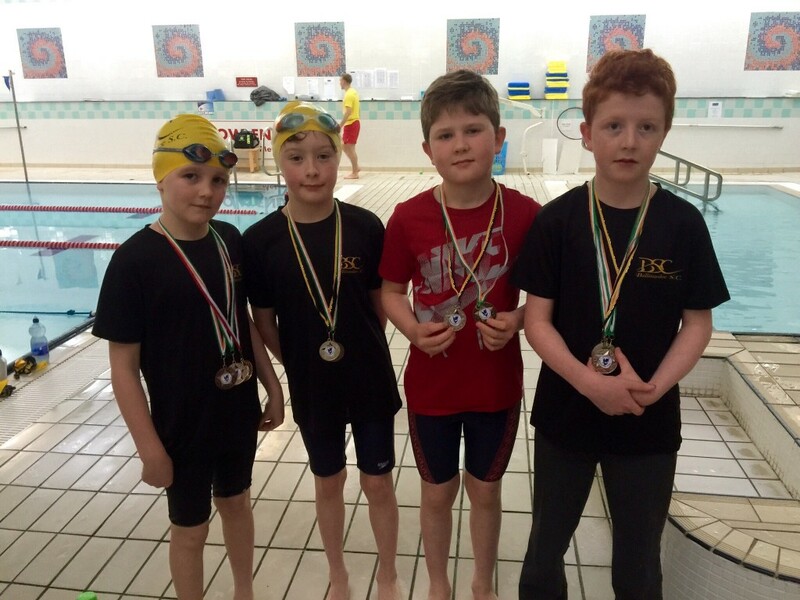 The B/C Graded Gala was on next and 5 of our swimmers competed. Caoimhe Kennedy put in a fantastic performance in the 11&U 100m Backstroke where she got a great time of 1.36.83, this was just .83 of a second outside the A time and she earned a Bronze medal for her B time. Caoimhe got an excellent B time of 1.52.43 in the 100m Breaststroke. She got a Gold C time of 1.32.52 in the 100m Freestyle which is just .52 of a second outside a B time. Rowan Harley swam in the 12-13 100m Backstroke. He got a great time of 1.39.61 which earned him a Silver medal for his C time. Rowan also competed in the 100m Freestyle where he earned a great B time of 1.23.65. Niall Costello put in a great performance in the 12-13 100m Breaststroke, he got a B time of 1.56.78. He also swam very well in the 100m Freestyle winning a Silver C time medal. Ethan Moran swam in 14&Over 100m Breaststroke, he got an excellent A time of 1.29.82. Well done to all those who competed it if great to see their hard work paying off. Congratulations to Ballinasloe Swimming Club members Ava & Kayla McKeon who took part in the SSE Airtricity National Schools Modern Biathlon National Finals which were held last weekend at the National Pentathlon Centre in Dublin. Both Ava & Kayla represented Creagh School in the U10 Girls 800m run & 50m Swim. Despite an ankle injury in the middle of her run Ava finished in 1st place in both the run & swim which resulted in her being in 1st position overall in her age group. If she had not injured her ankle she would have had the highest points amongst all age groups, she ended up with the 2nd highest score throughout all age groups. Kayla was also U10 therefore she was up against older children. She had the 3rd fastest time in the 800m run & came in 5th position overall in the U10 girls. Well done to both of them. 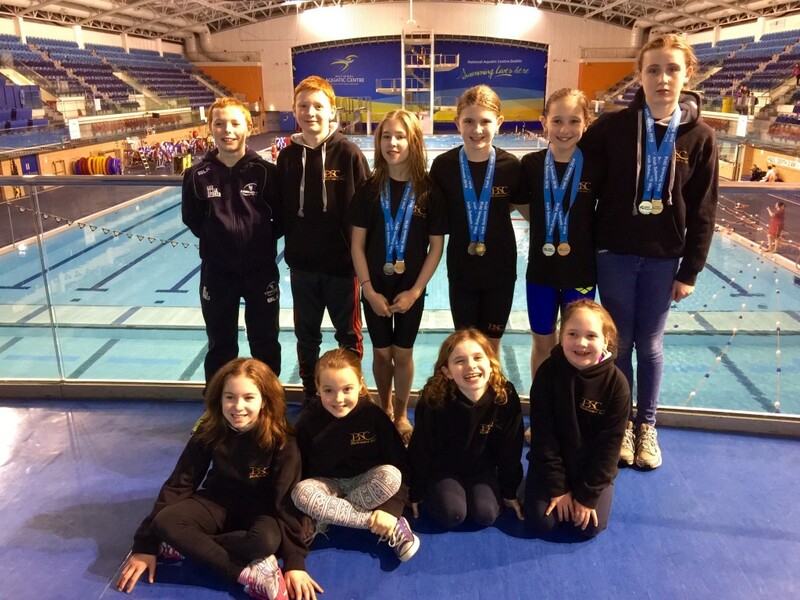 Ballinasloe & District Swimming Club would like to congratulate 12 of our swimmers who participated in the Trojan Gala which was held in the National Aquatic Centre in Dublin on Sunday April 12th. The competition was exceptionally strong with over 600 swimmers competing on the day including swimming clubs from Belfast, Enniskillen, Dublin, Waterford, Kilkenny, Cavan Dundalk, Mullingar, Longford & New Ross. 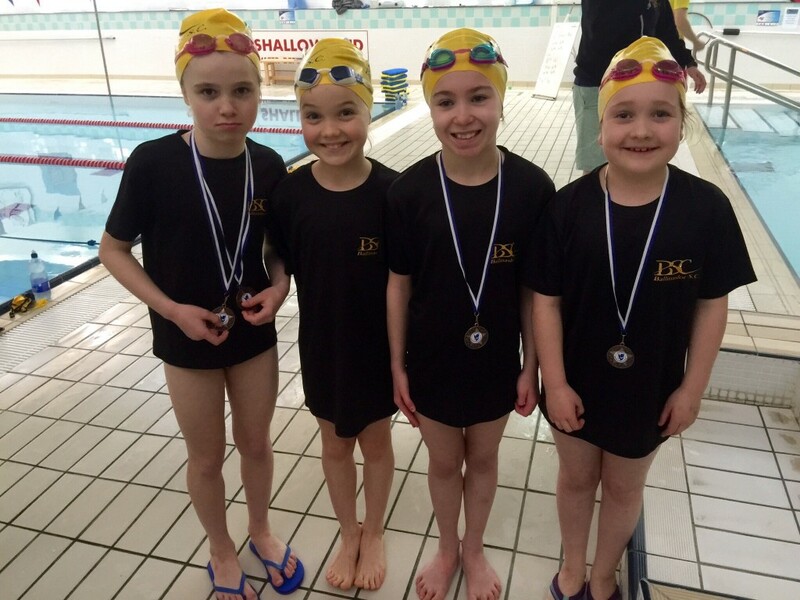 Our 10&U girls relay team did us proud up against strong competition. Ruth Dolan, Ava McKeon, Caoimhe Kennedy & Ailbhe Hanrahan all put in fantastic performances to finish in 1st place. Well done girls! 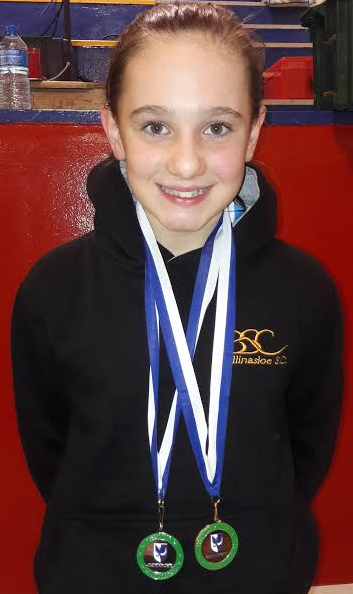 Ruth Dolan won Gold in the 10&U Breast & Butterfly, Silver in the Backstroke and came 4th in the Freestyle. 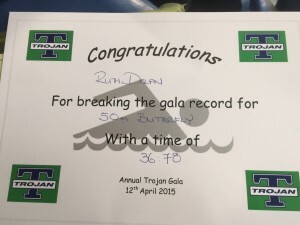 Ruth beat the Gala record in the Girls 10&U Butterfly with an amazing time of 36.78 which was a marvellous achievement. This is the 2nd year in a row that Ballinasloe beat the Gala record for the Butterfly, Ava McKeon got it last year for the Girls 8&U Butterfly. Ava McKeon won 2 Silver in both the 9&U Breaststroke & Freestyle & also won 2 Bronze medals in both the Backstroke & Butterfly. Tara McKeon was up against stiff competition as she is 11 but was also up against 12 yr olds. She had 5 strong swims on the day & got a splendid time of 1.16.76 in her 100 Freestyle which is less than 2 seconds off a Division 2 time. 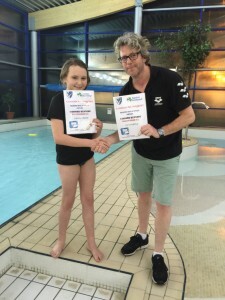 Caoimhe Kennedy also performed exceptionally well placing in the top 10 in both the 10&U Freestyle & Backstroke. 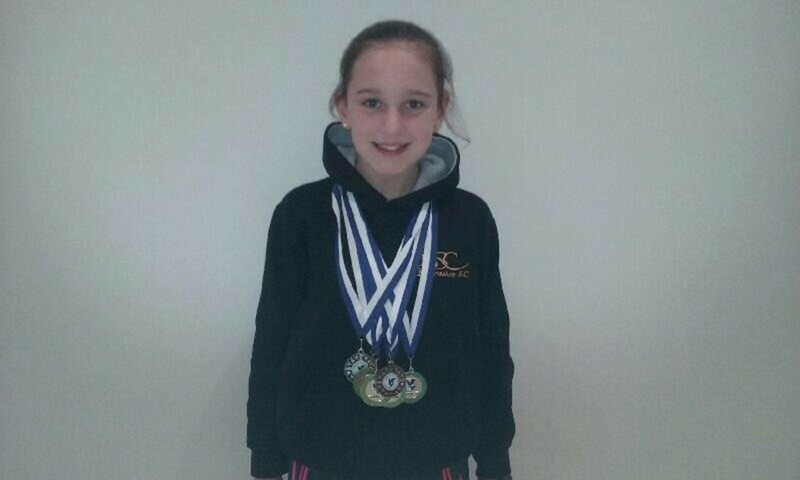 Ailbhe Hanrahan also had 3 strong swims in the 10&U Freestyle, Backstroke & Breaststroke. Tani McCormack swan well in all 4 strokes in the 9&U Girls. Kayla McKeon finished in the top 10 in both the 8&U Backstroke & Breaststroke. Erin Gallagher competed in the U9 Backstroke & Breaststroke & swam well in her very first gala. James Mooney competed in the 11-12 50 & 100 Breaststroke. James who is 11 was also up against older boys but performed strongly in both swims. He got a fantastic time of 1.38.50 in the 100m Breaststroke which is a Division 2 time. Conor Hogan who is 11 also swam against older competitors in the 11-12 boys Freestyle, Backstroke & Breaststroke. He swam well in all 3 strokes.